While thinking about how he might bring together his cartooning skill and newspaper work experience, Nease one day picked up the Toronto Star and flipped to the editorial section. With an enlightened grasp on what the cartoons were about, he thought I'll try some of those. "My very first political cartooning influence would have been Duncan Macpherson in the Toronto Star. 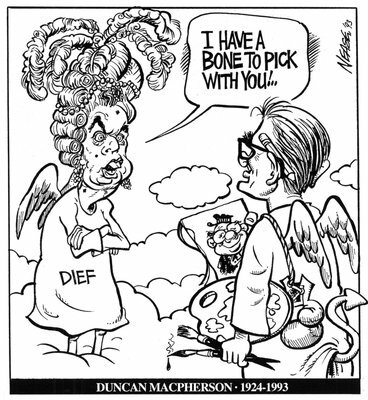 He was their regular daily cartoonist and probably the most famous Canadian political cartoonist of all time. So he was a pretty good person to be inspired by." "It takes a while, but eventually you stop looking at other people’s work, and your own content and style starts to come out naturally. Then that style evolves over the years. You don’t notice it from a day to day basis, but if you start looking at it from a decade to decade basis, you see huge differences."